Like dresses, jumpsuits come in many shapes and sizes. 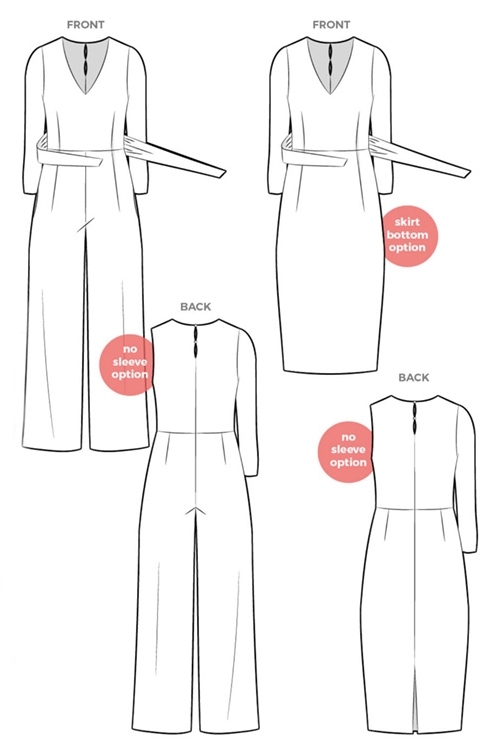 The Brice jumpsuit is versatile and will suit most people’s needs. Brice is designed to work with knit fabric, which is a big tick in the box when it comes to comfort! Whether you’re needing a sleeve to keep those arms warm in the colder months or sleeveless to beat the heat, Brice has both. The flattering V-neckline works well on many body shapes and is beautiful if you have some lovely jewellery to highlight. There’s some tucks at the waistline to break up the silhouette, and the added belt will define and flatter your waistline nicely. The leg is a mid-width leg shape that works well on shorter bodies but the sewing pattern caters for all heights with a shortening and lengthening line. To complete the versatile pattern, Style Arc has added a pencil skirt to offer you a different look all together! Perfect for playing with colour to create your own style of dress! This pattern is available in sizes 4-30.